Just go to the MCPE mods category and you'll find more than a dozen modifications that add dogs, cats, hamsters and other pets. Of course, not everyone wants to download mods separately, so the Animals addon is presented to your attention (more than 20 new animals). As for this addon, it adds realistic turtles. These cute and small amphibious creatures will inhabit your world and move slowly. Alas, they can not be tamed and are more suitable for improvised aquariums. There is no other meaning if you thought about turtle soup. How to install the Turtle addon? Start the game and go to settings. Activate the downloaded files (resource and behavior packs). 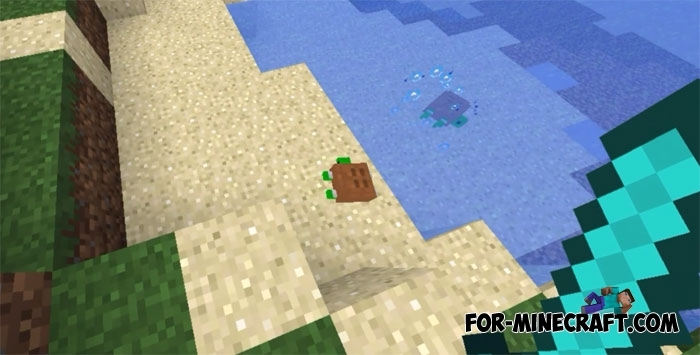 Turtles Pets addon (Minecraft PE)Would you like to start a home turtle but not as small as you could imagine it? The Turtles Pets addon adds giant turtles..
Ninja Turtles mod (MCPE 1.1)The Ninja Turtles mod contains the main features of the cartoon, which is known to all comic book lovers..
Ores Pets addon (MCPE 1.1)The Ores Pets addon turns ore blocks into living creatures which will become good fighters during battles with enemies. Minecraft PE [0.9.5] - Mod Super Ninja Turtles!Welcome to the review of the new mod for our favorite Minecraft Pocket Edition . So, in this article I will observe mod titled Super Ninja Turtles! I just love the Teenage Mutant Ninja Turtles.